A quick correction. This article originally said the TQBC auction raised more than $20,000. In fact, the auction was a part of the TQBC golf tournament. The auction did raise a significant portion, though less than half. To succeed in a short-term online effort, you balance beauty and functionality. If the page is beautiful, but entirely ineffective, the audience will love the eye candy but ignore whatever it is you want them to do on your site. If your site is a functional eye-sore, your audience won’t stick around long enough to interact with your page. 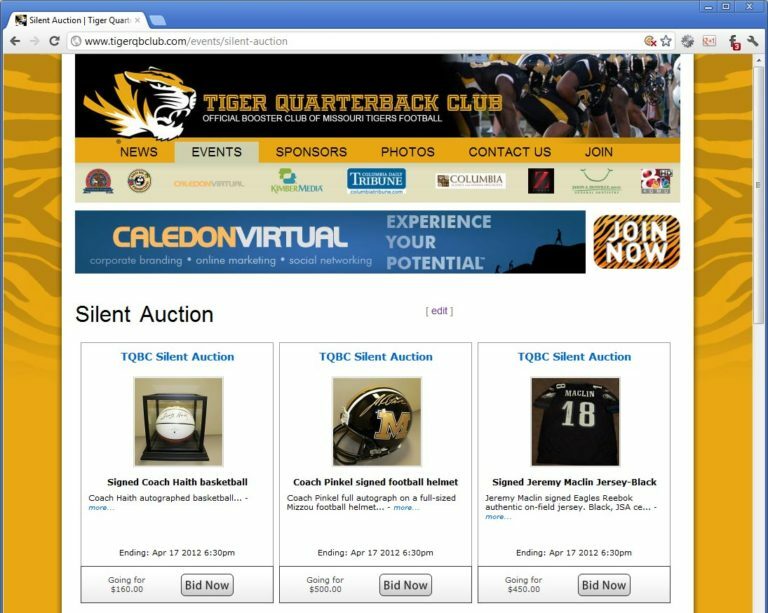 As an example, we recently developed the Tiger Quarterback Club’s silent auction. In keeping with our traditions, the interface was clean, fast and reliable, and auction organizers were elated with the results. The Club has grown from about 350 members to more than 500 members over the past year (you should join, too). Much of this can be credited to the efforts the Club has taken in social media (with the help of our friends at KimberMedia) and brand development efforts. And the success with TQBC landed Calevir an opportunity to develop the online auction for the Guatemala Milk Program‘s Fiesta de Guatemala (more on that next week). When you have a place online people feel comfortable coming to, and want to interact with you in, success is much easier to achieve. Get in touch with us today, and we’ll get you started on your new digital home.